Buhot moved to Paris in 1865 from Valognes in Normandy and shortly after enrolled at the École des Beaux-Arts, determined to forge a career as a painter. He was taught to make etchings in around 1873 and in the same decade completed the first of a series of illustrations for novels by the dandy writer Jules Barbey d’Aurevilly (another son of Valognes). Buhot’s first exhibited etchings – reproductive works with a markedly Japoniste aesthetic – appeared at the Salon of 1875. However, his activity as a reproductive printmaker and illustrator was curtailed as he began devoting most of his creative energies to original printmaking. He is primarily known for his highly atmospheric etchings of London and Paris streets. These lively cityscapes were widely exhibited and admired in France, winning him the esteem of the art establishment and resulting in his invitation to design the frontispiece to volume IV of Henri Béraldi’s Les graveurs du XIXe siècle (the first authoritative catalogue of 19th-century French printmakers) (opposite, below). But the largest market for Buhot’s work was in America, where the New York dealer Frederick Keppel arranged his first retrospective exhibition in 1888. Buhot was obsessed with the ‘fine art’ aspects of printmaking. More than any other French artist of his era he pushed the notion of the print far beyond that of its most fundamental raison d’être – namely as a means of multiplying duplicate images – and aimed to make every impression he printed an object of unique and rarefied beauty. Indeed, the fascination of his oeuvre lies in the bewildering permutations that exist of single etchings, of which there are rarely definitive versions or states. Buhot’s choice of ink and paper was very important in his conception of the print as an expression of individual artistry. Quite apart from changes he might make to an etched design (often enhanced with aquatint, drypoint or roulette), he experimented with producing variations from one impression to another in the printing process itself: to this end he employed inks of contrasting colours and consistencies (which could be more or less manipulated on the plate), as well as papers of different textures and tones. In his fastidious attention to such matters, Buhot displays a high aesthetic sensibility such as we encounter in the work of James Abbott McNeill Whistler. Ever insistent on the individualised nature of his etchings, Buhot provocatively referred to them as ‘paintings on copper’. He declared that ‘original etchings with the characteristics of a composition and without any special purpose are for me paintings’. The Gallery’s impression of Westminster Bridge is unusual by virtue of its support: Buhot chose to print a number of impressions from this plate on artificial parchment, the mellow surface of which is less absorbent than paper so that more ink remains on the surface, imparting a lustrous sheen to the print. The addition of the artist’s stylised owl stamp (located directly beneath the owl carrying a lantern in the lower centre) frequently designates what Buhot himself considered to be a special impression. The words épreuve d’artiste (artist’s proof) must, as is often the case with Buhot’s inscriptions, be taken with a grain of salt. For the print is not strictly a working proof at all but a fully realised impression intended for exhibition. A distinctive and highly attractive feature of Buhot’s prints is the use of marginal sketches to surround the central image. Buhot termed these marges épisodiques and marges symphoniques; the former type relating in theme to the main image, the latter type serving as purely decorative embellishments. 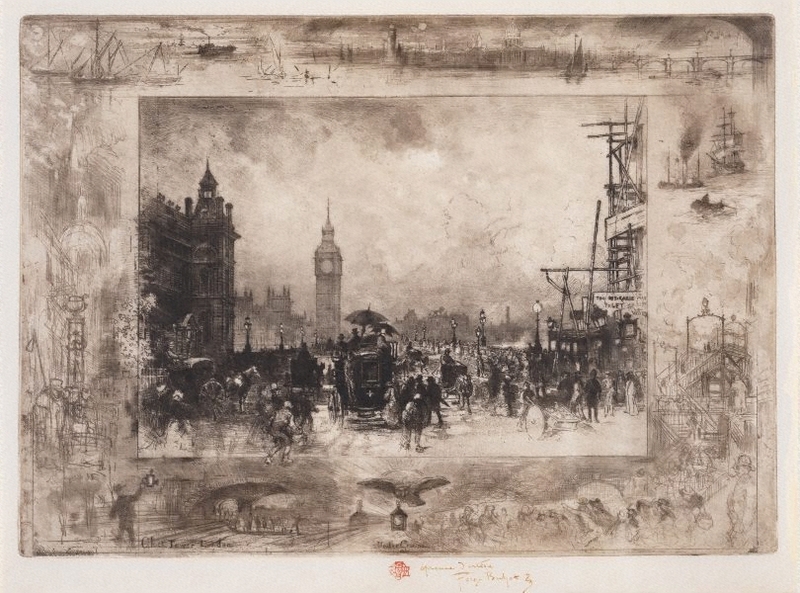 The interconnected vignettes which frame Westminster Bridge are more freely sketched than the central image and are etched with a shallower bite. They illustrate the impact of modernity on the city: the excitement of the newly opened underground railway, one of the great construction projects of the 19th century, designed to transport large numbers of individuals in and out of the metropolis. In the top margin the moonlit dome of St Paul’s Cathedral overlooks the Thames, with its mix of industrial and leisure craft. Buhot first visited England in 1876 and was instantly enamoured with London life. The print is based on drawings made there in 1883. It shows the entrance to Westminster Bridge from the south (Lambeth) side, with a view of the Houses of Parliament and Big Ben at the north end. In sharp contrast to these august buildings, a construction site with scaffolding advertises new apartments for let. Signed l.c. sheet, pen and brown ink "Felix Buhot". Not dated. Les graveurs du XIXe siècle , Paris, 1885-1892, vol 4 (1886), p 33, nos 155–156. Félix Buhot. Catalogue descriptif de son oeuvre grave , 1979, pp 97–98, no 156. Félix Buhot peintre-graveur, prints, drawings, and paintings , Baltimore, 1983, pp 59, 114, no 79, illus p 59, fig 49,. AGNSW Collections , Sydney, 1994, col illus p 131. Prints & drawings Europe 1500-1900 , Sydney, 2014, p 162, col illus p 163.